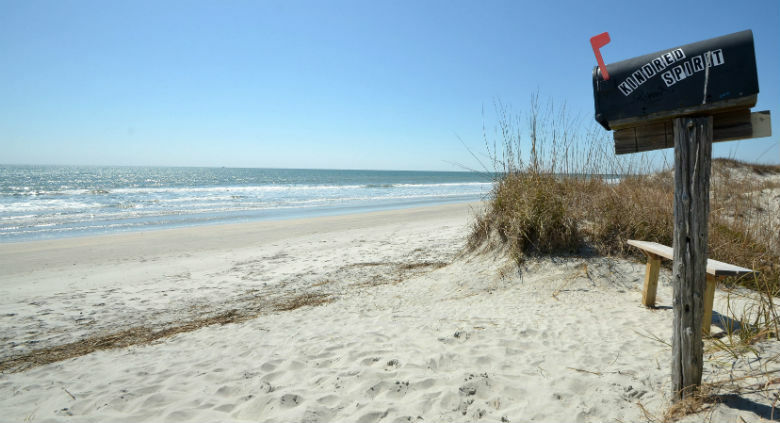 Learn more about Bird Island NC – located just outside of Sunset Beach near Ocean Isle Beach. Bird Island is an island located just off the coast of the Carolinas. Bird Island is unique because it’s not developed – just long white sandy beaches. A totally unique place – Bird Island is like no other spot from Ocean Isle Beach to Myrtle Beach. With places to walk, relax and just enjoy without any neon lights and noise. Bird Island is home to great fishing spots too. Just off the island you can toss a line and enjoy catching redfish, hogchokers, grouper, sea bass and tons more. Fishing from the island will let you relax and have a good time just enjoying the quiet and calm waters. Not just in the water, Bird Island has all kinds of wildlife! From goats to sea stars back to alligators and deer, the amazing number of animals (both land & sea) on the island is a sight to see. If you’re looking to see some photographs of different wildlife on the island, check out this website. If you’re waiting for some others to finish fishing, you can of course drop by the Kindred Spirit Mailbox, a local attraction in its own right. The Kindred Spirit Mailbox lets you leave letters in blank notebooks for all to see and share with the world. It’s a very private and intimate experience. When you go, you’ll see notes from others on lost love, triumph and more. In addition, Bird Island, NC is home to ecological studies and wildlife research. Animals like loggerhead sea turtles are protected at the island by the Coastal Reserve and National Estuarine Organization.